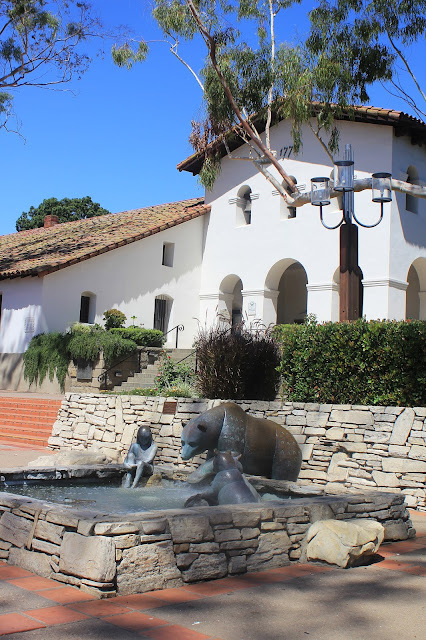 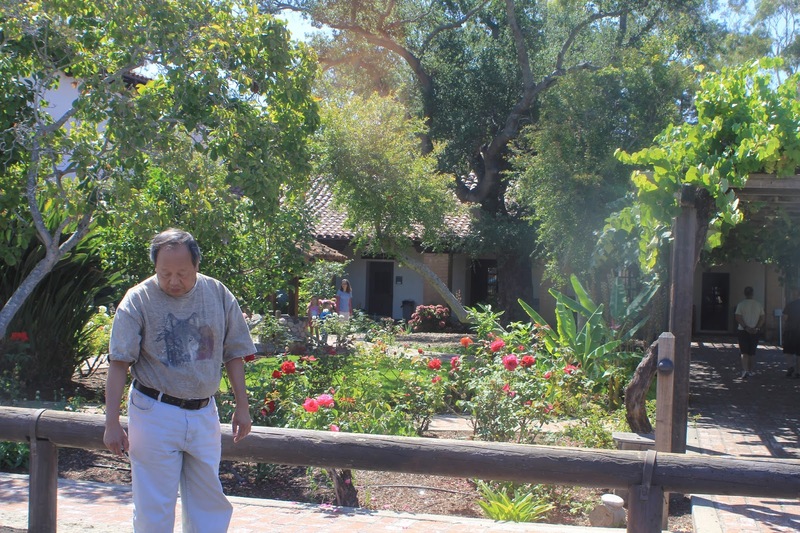 On the third day of our 2015 summer vacation/California Mission trip along the Central Coast, we visited Mission San Luis Obispo de Tolosa in, where else, but the City of San Luis Obispo. 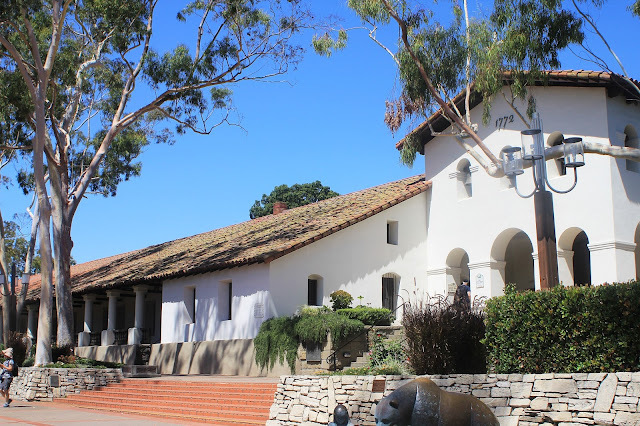 Whereas Mission La Purisima Concepcion in Lompoc, which we visited the day before, was a State Park that encompassed hundreds of acres and left in its natural state, Mission San Luis Obispo is a working and thriving parish in the heart of busy downtown San Luis Obispo surrounded by restaurants, museums, and parks. 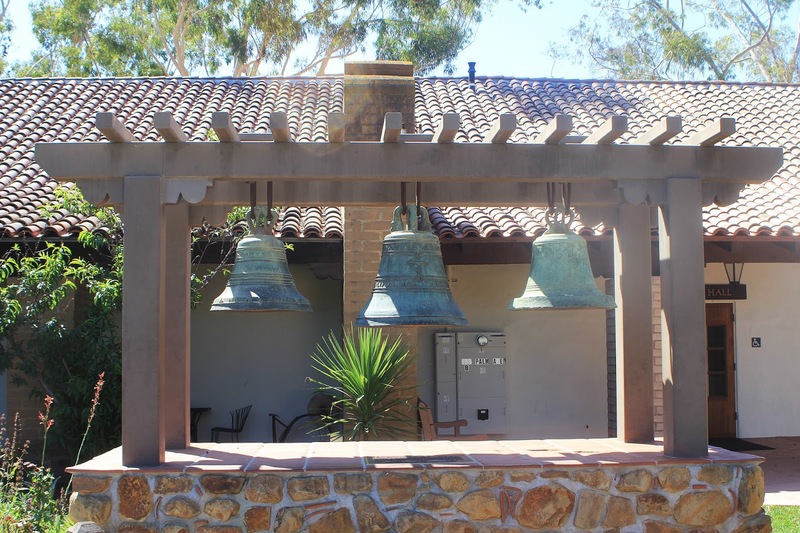 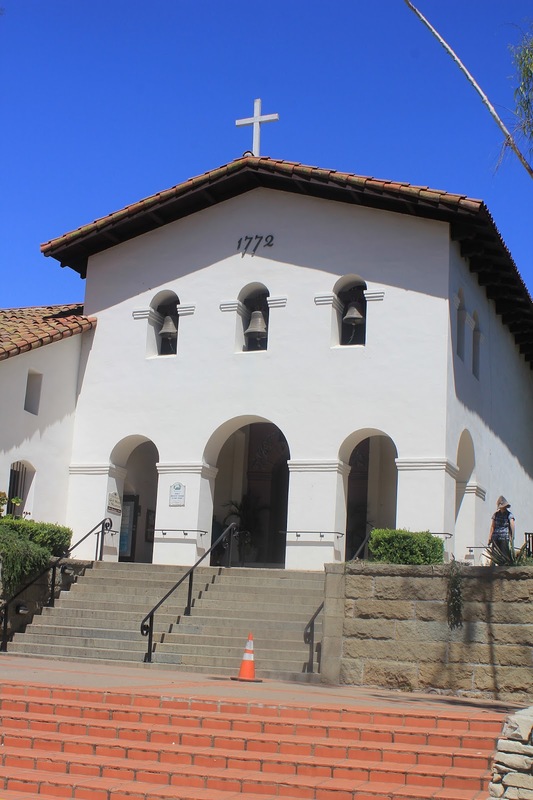 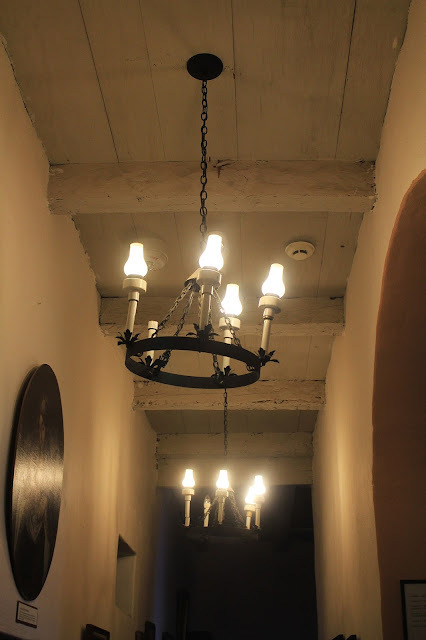 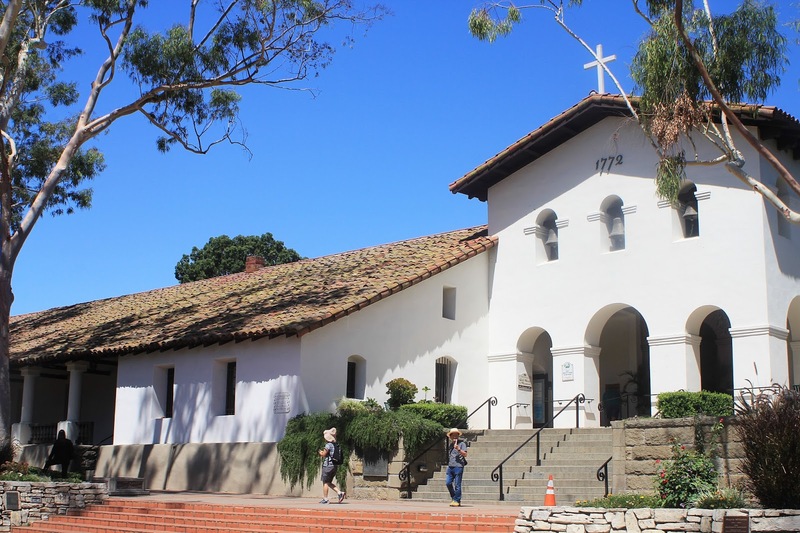 It's a walkable, picturesque, and friendly destination that invites you to venture back over and over again, which is something we definitely must do because we inadvertently missed seeing the interior of the Mission church! Entrance to the Mission Church. The self-guided tour started from the back entrance, and included only the museum portion and not the inside of the church itself (I'm sure because the church is an active parish and they don't want boorish tourists disrupting the parishioners during worship). 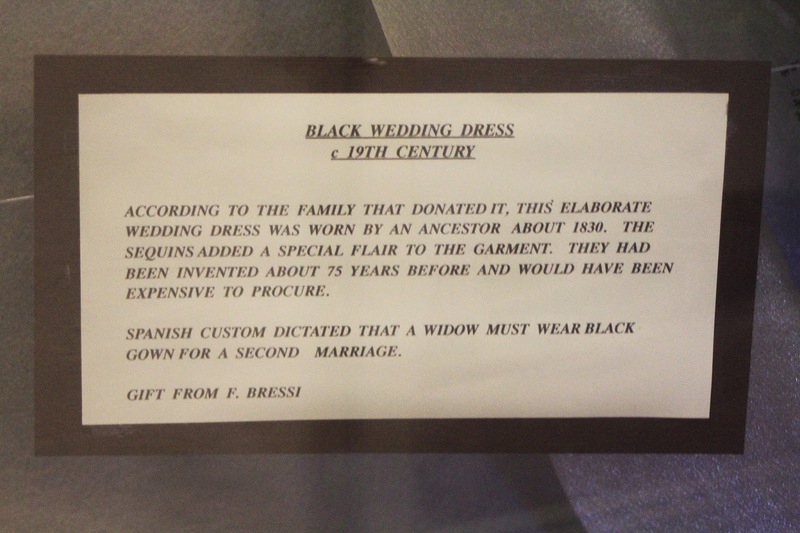 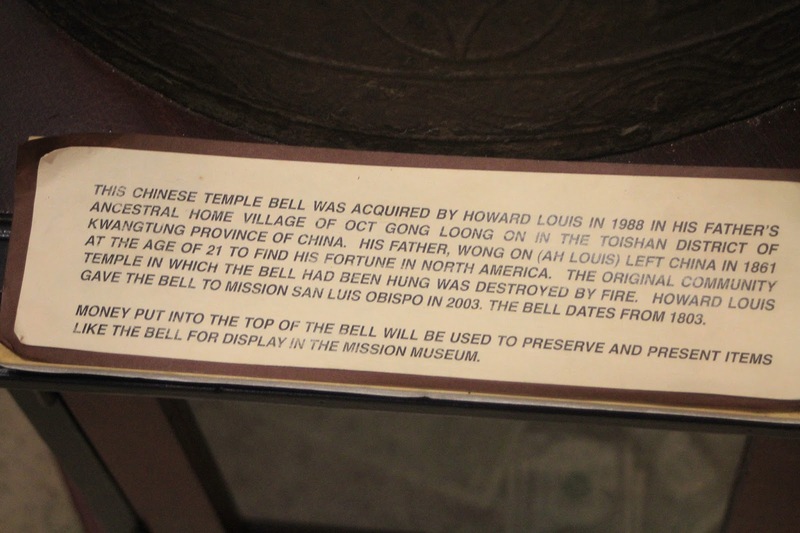 That fact totally escaped us at the time, so we missed seeing the church interior before leaving for lunch. I'm embarrassed to say that I thought the altar behind the glass wall was "The Church." 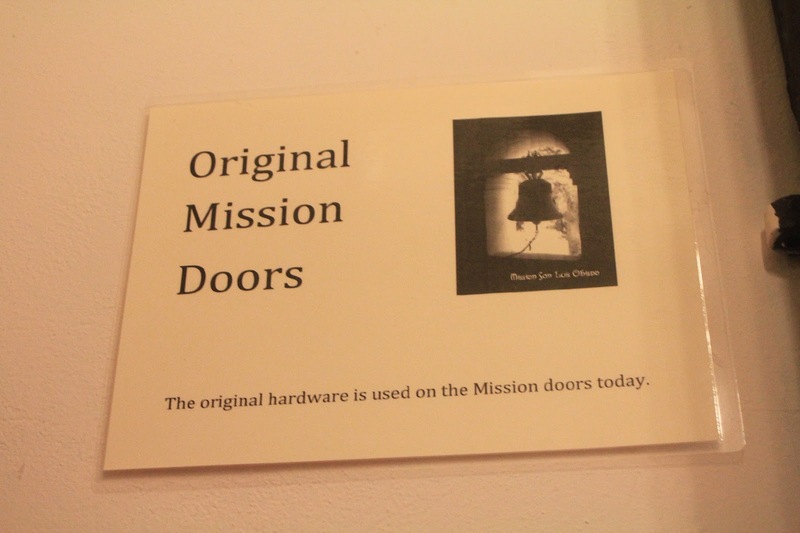 My bad. 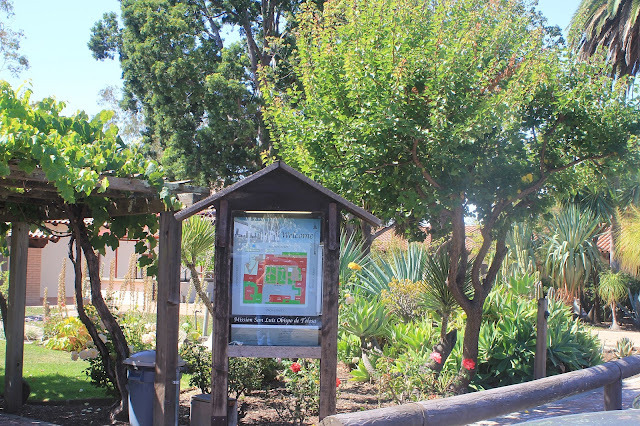 Back entrance where the Mission garden is situated next to a small parking lot off of Palm Street. 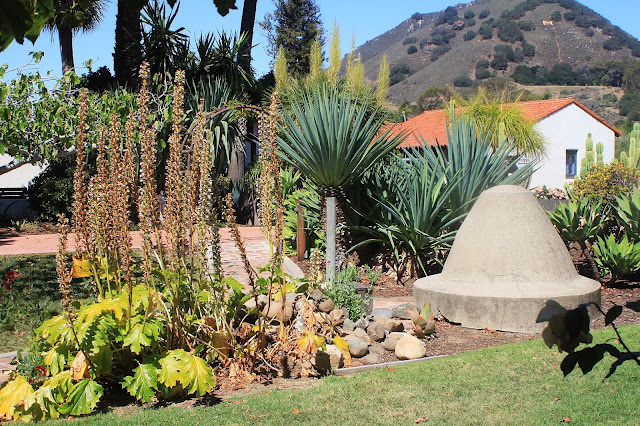 These look like Acanthus plants (Bear's Breeches) growing in the Mission garden. Behind is a large Santa Maria style BBQ pit. 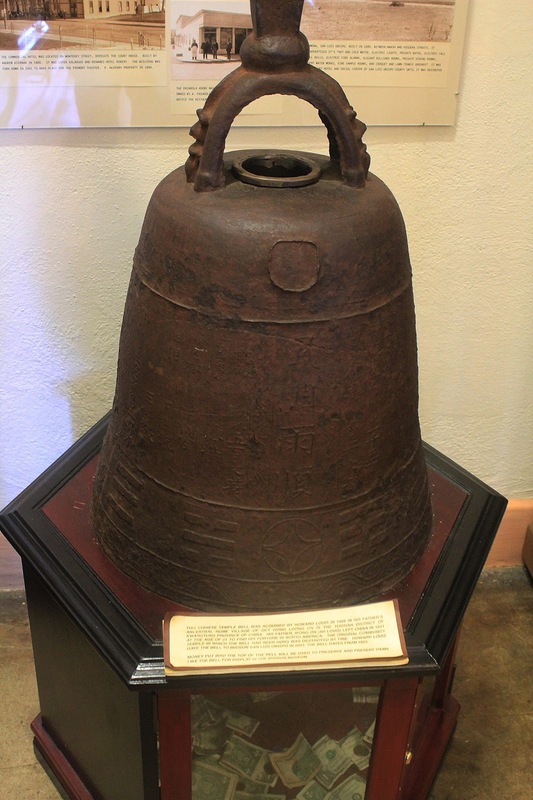 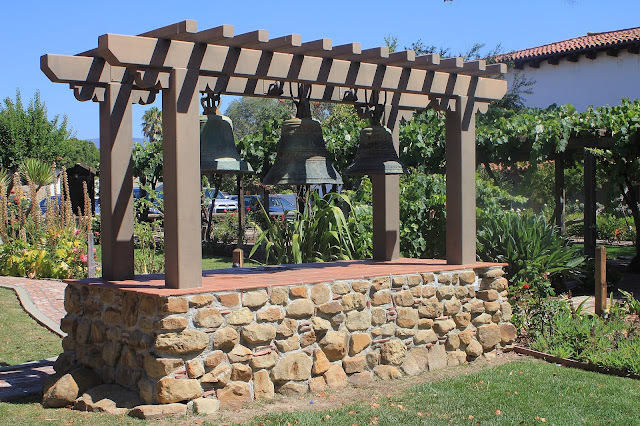 These were the bells that used to hang in the front facade of the church. 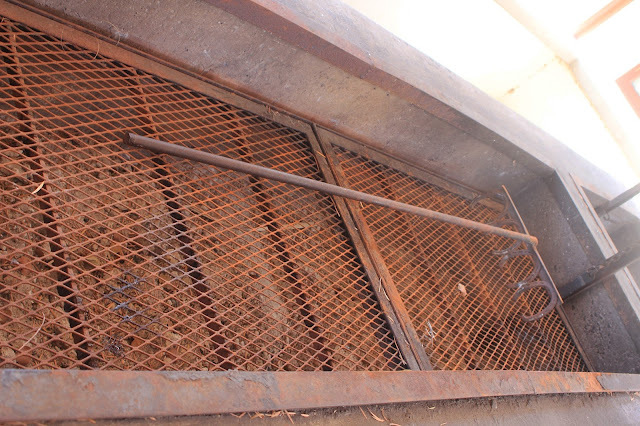 Another view of the BBQ pit, which is not a historic relic, but a pit of modern construction that is currently used by the parish to produce what I'm sure must be some fabulous good eats. 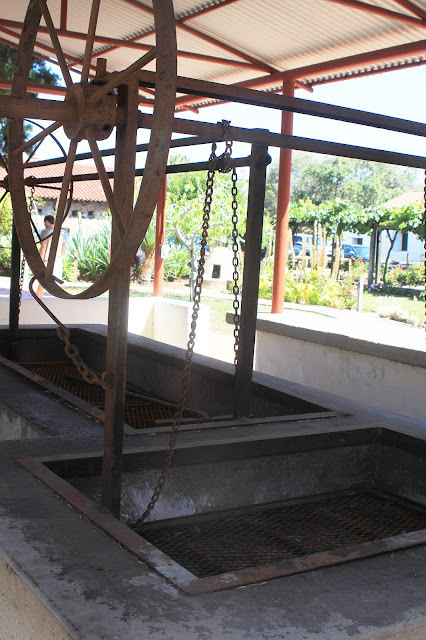 Now THAT'S the BBQ pit I want for our back patio Gil - take note! 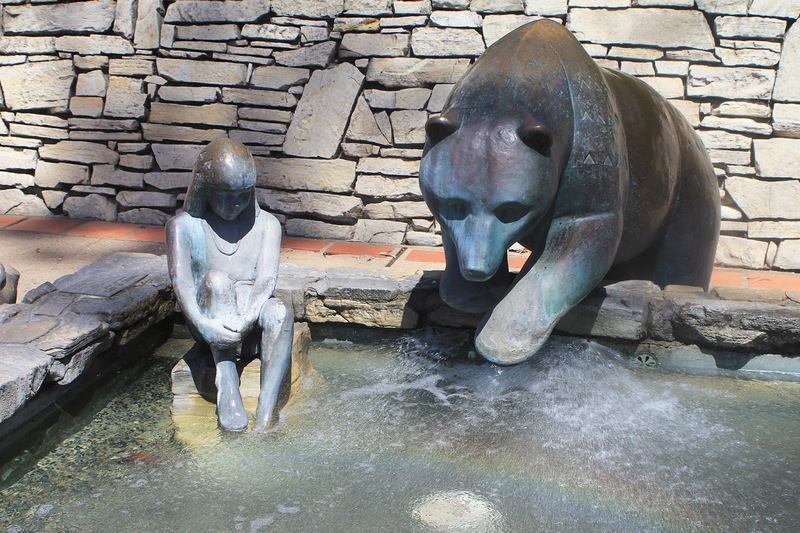 Fountain with statue of Chumash child and grizzly bears on the Mission Plaza. The sculpture Tuquski Wa Suwa ( Bear and Child) was dedicated in 1988. 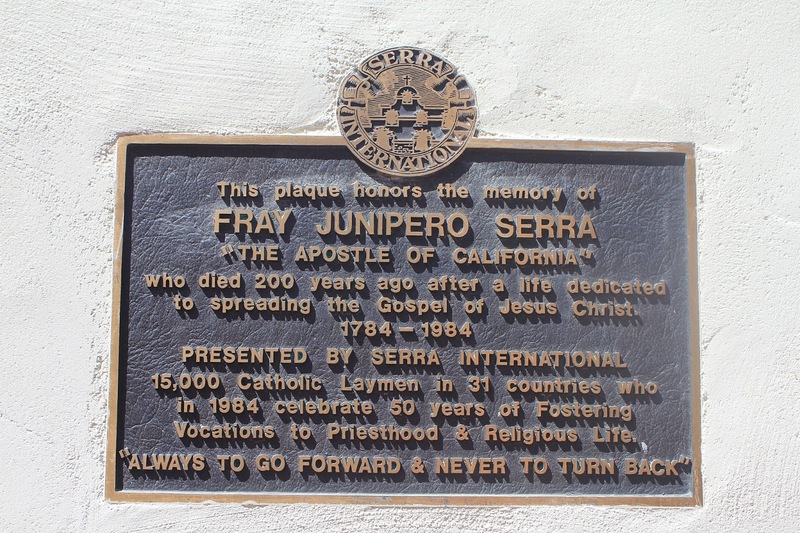 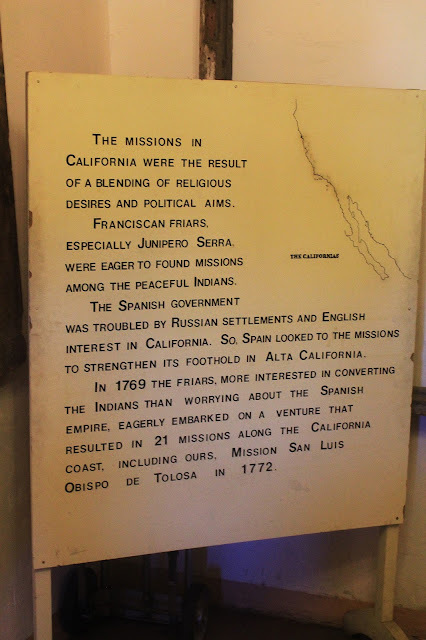 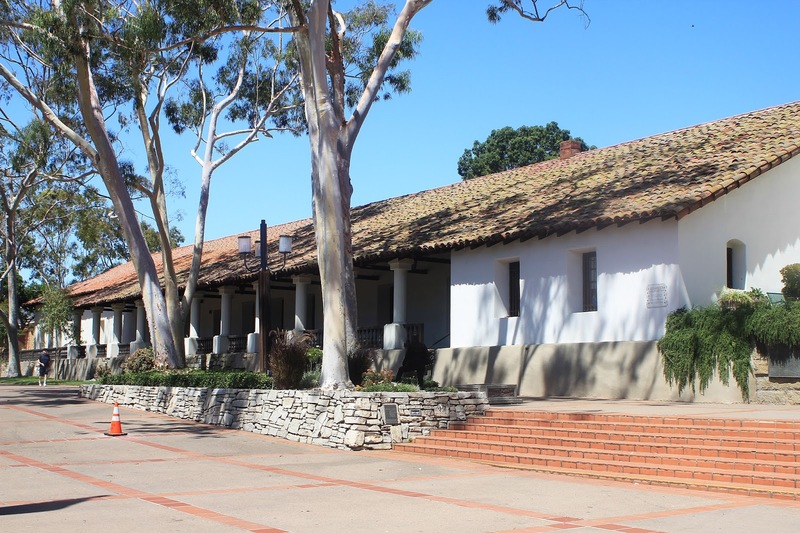 Indians Joining the Mission: San Luis Obīspo was the first mission founded in the land of the Chumash people. 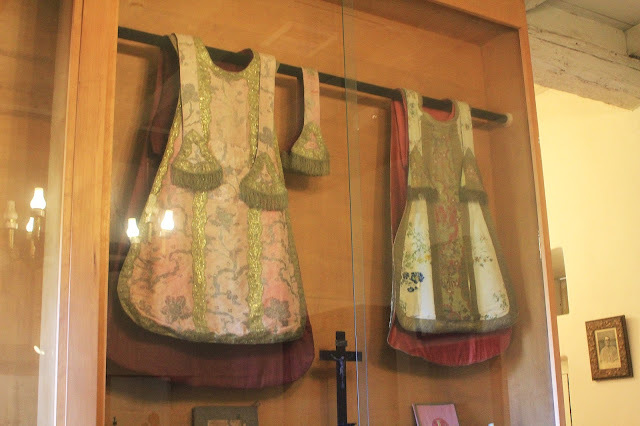 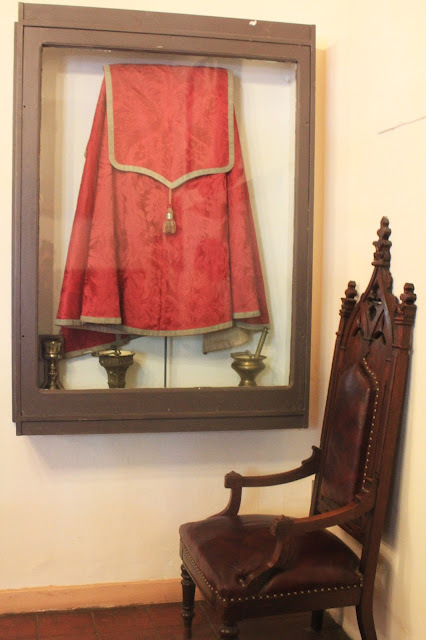 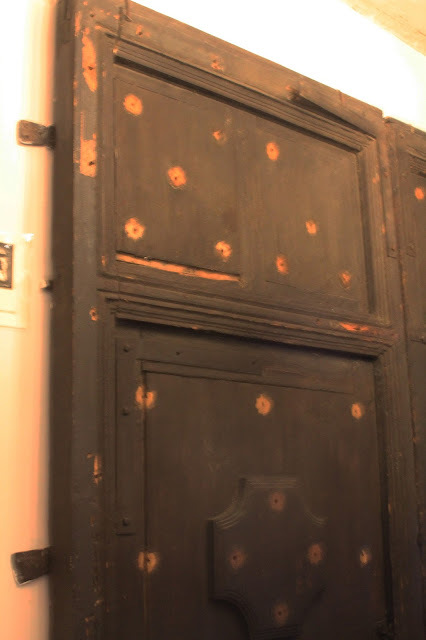 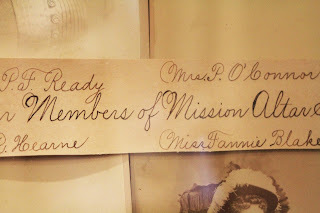 The neophytes at the mission were called Obispeño. 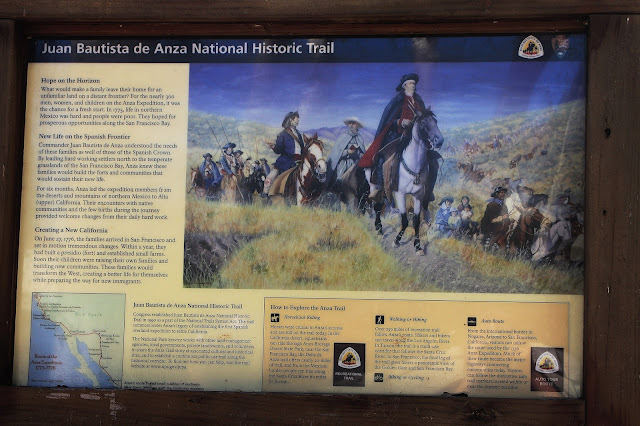 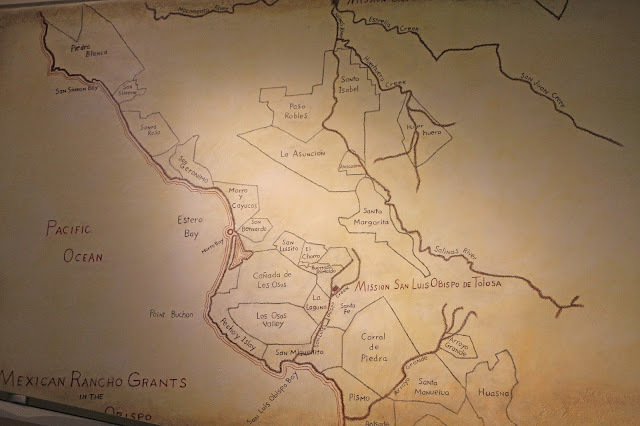 Mission Site: Located in a spacious valley along the central coast which the Spanish named "La Cañada de los Osos" (Valley of the Bears) when they discovered many grizzlies there. 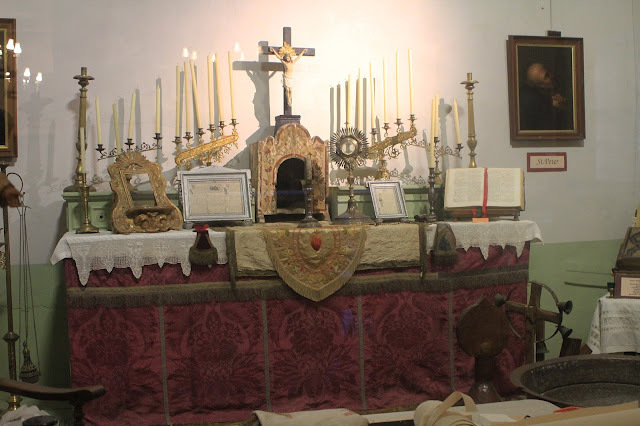 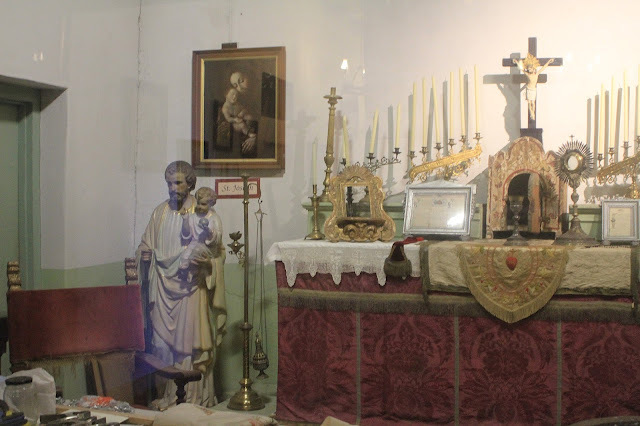 Unlike many of the missions which we re-situated over time, San Luis Obīspo stands on its original site. 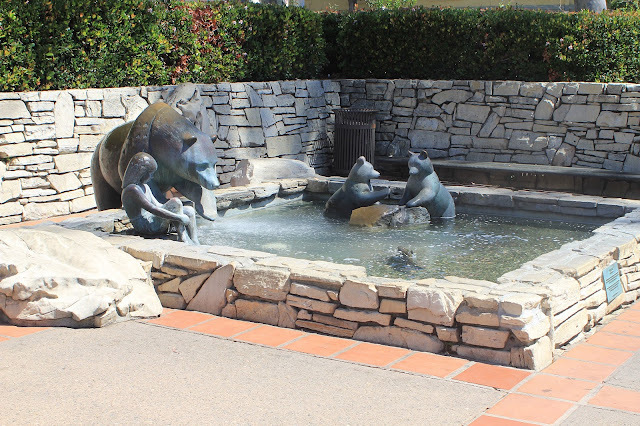 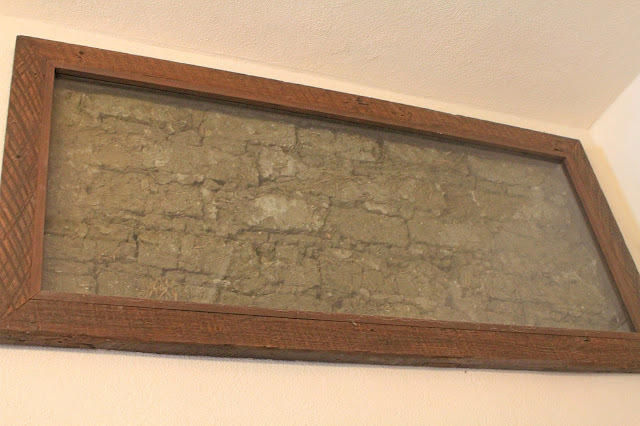 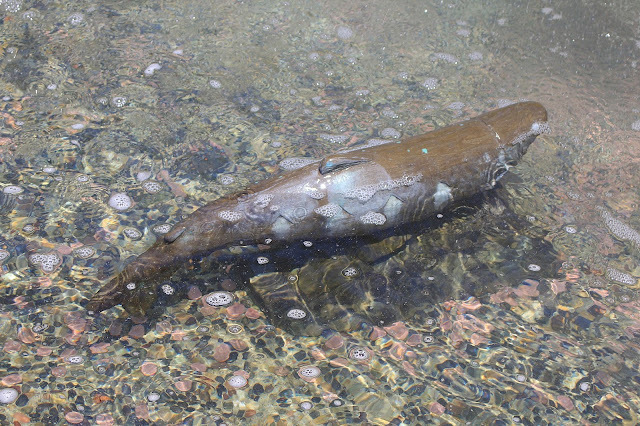 Water Source: San Luis Obispo Creek which was described as "having the finest water." 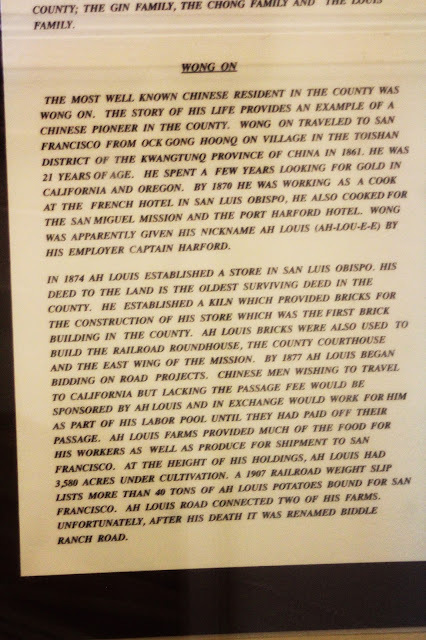 Livestock: San Luis Obispo had a relatively stable livestock herd during its last twenty years as a mission, with twice as many sheep as cattle in most years. 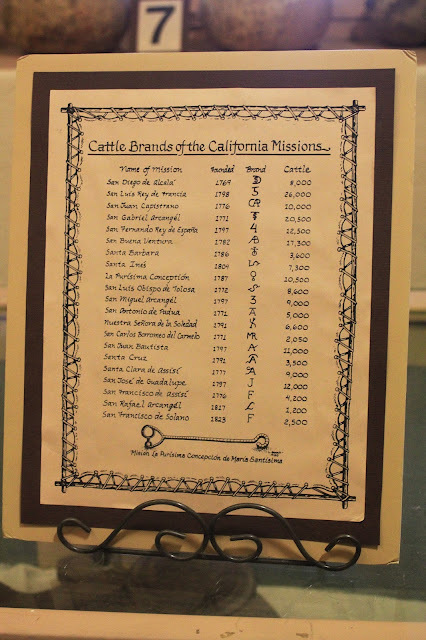 1832, the last year for which we have detailed records, the mission had 2,500 cattle and 5,422 sheep. 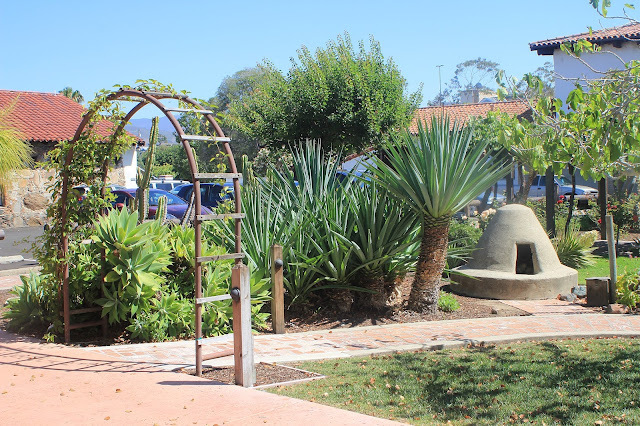 Agricultural Output: Over the years 1804 - 1832 San Luis Obispo produced 167,000 bushels of wheat, barley, corn, beans, peas and lentils. 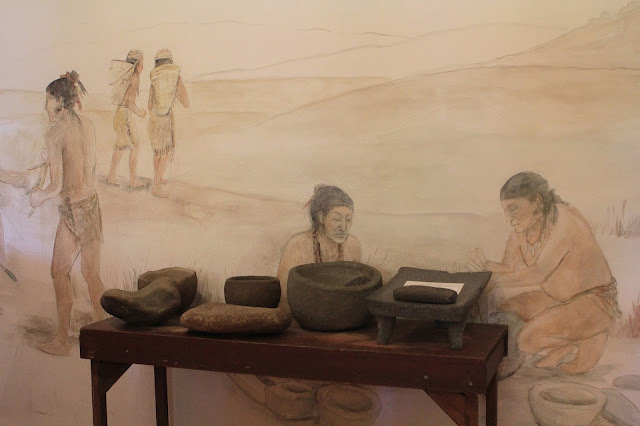 Despite its relatively small population, it had the fourth highest production of wheat in the entire chain. 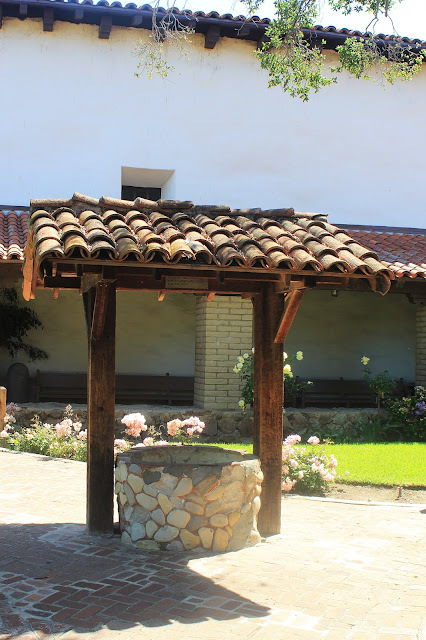 The mission even had its own grist mill. 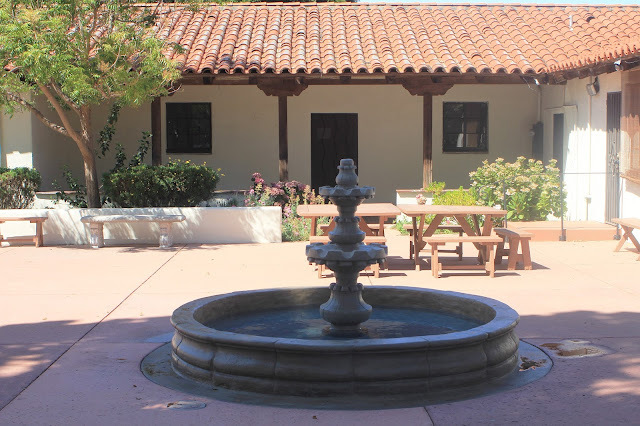 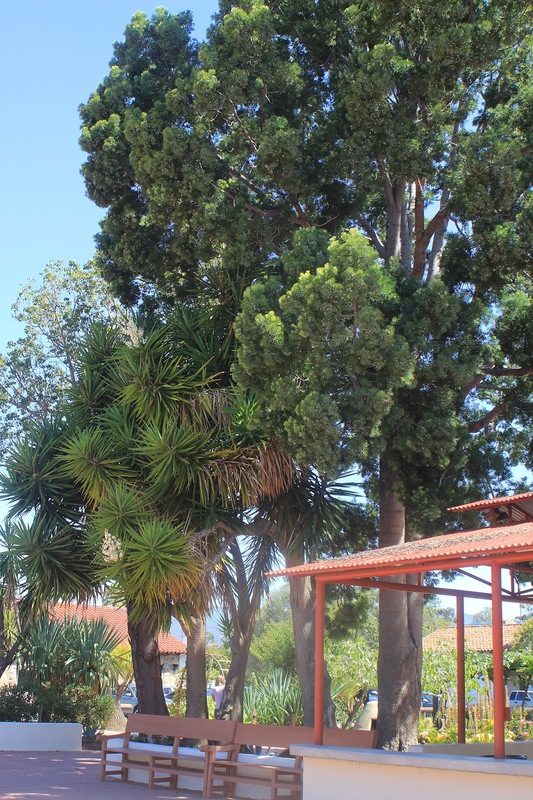 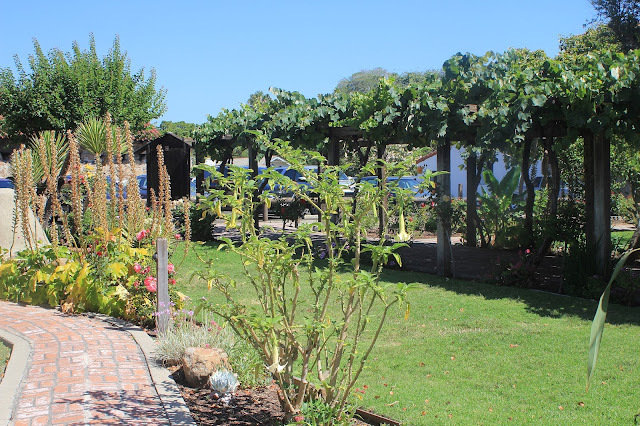 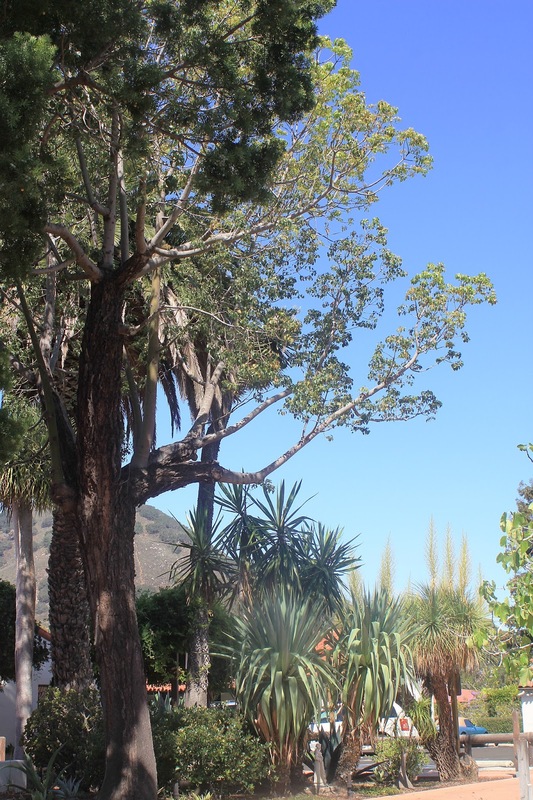 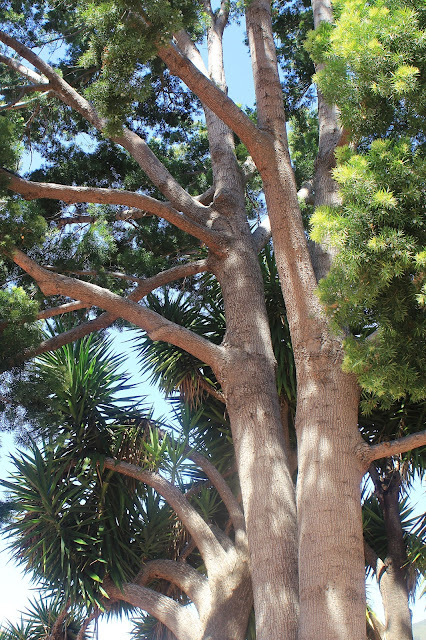 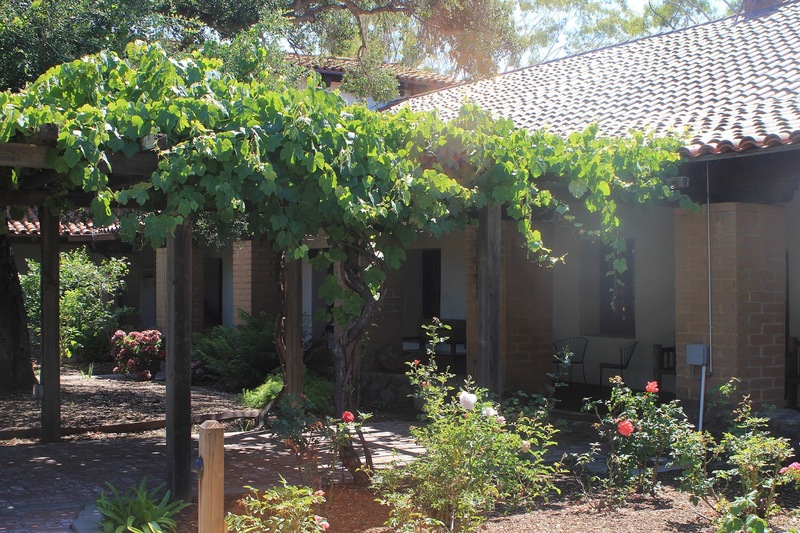 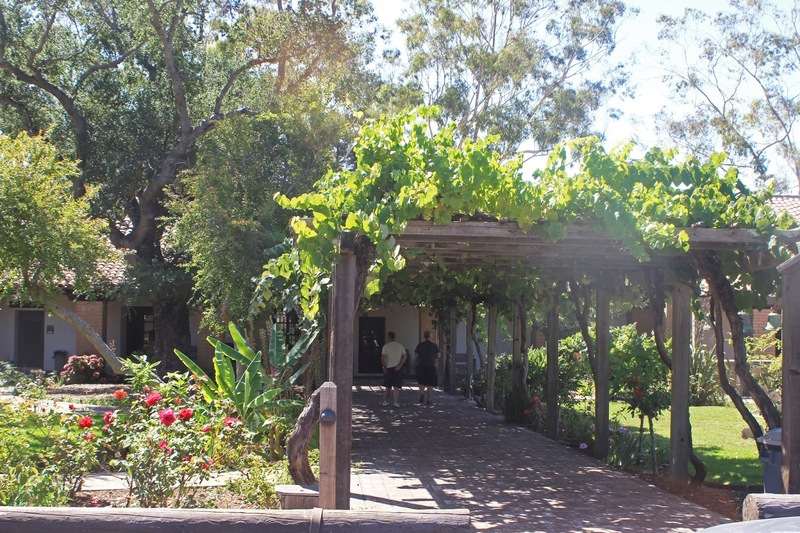 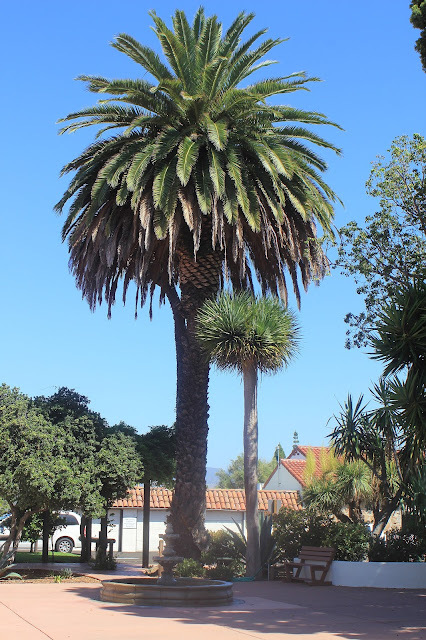 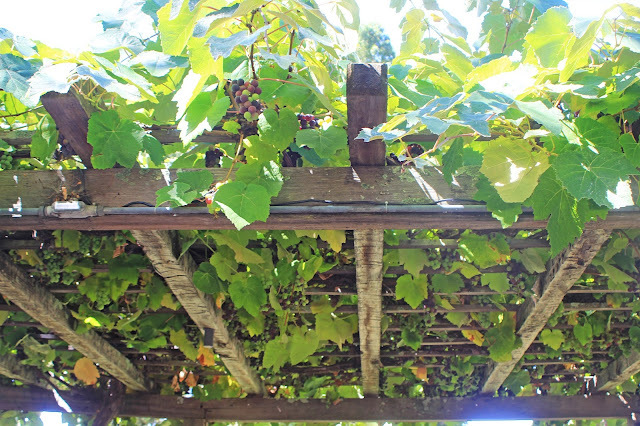 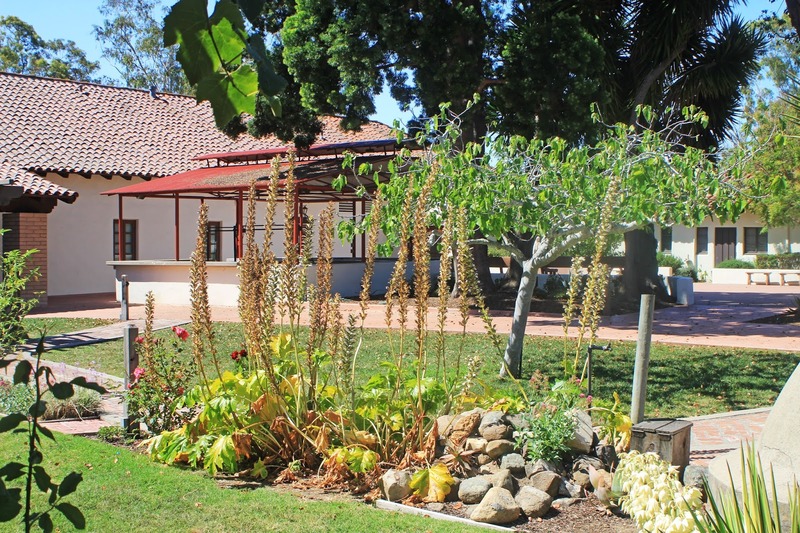 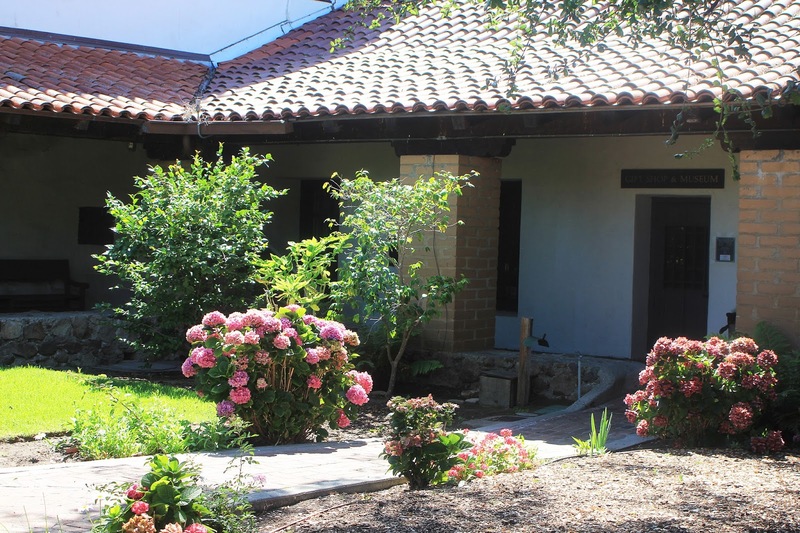 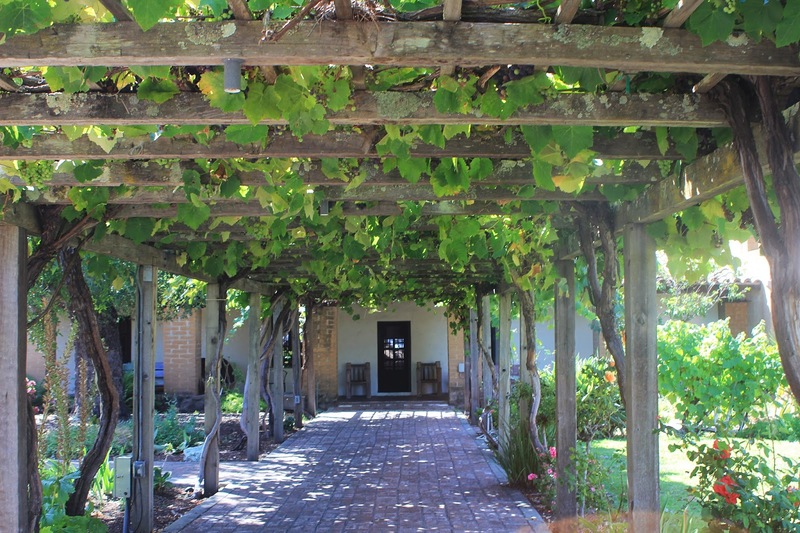 San Luis Obispo had grape arbors within the mission quadrangle and there was a garden in the northeast corner. 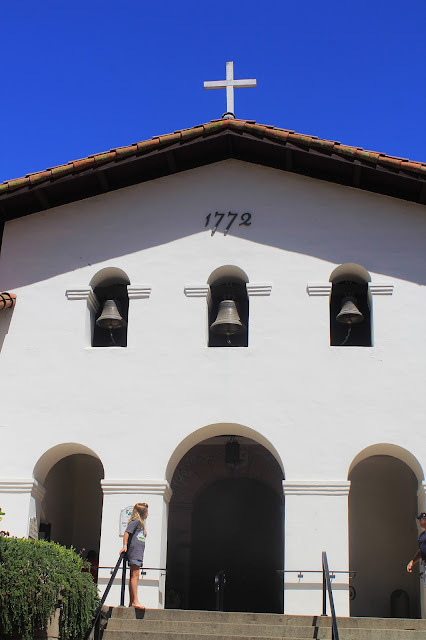 Mission Church: The San Luis Obīspo church was built in 1792-94. The prominent numbers inscribed on the church facade refer to the year the mission was founded in 1772. The vestibule was added in 1820. 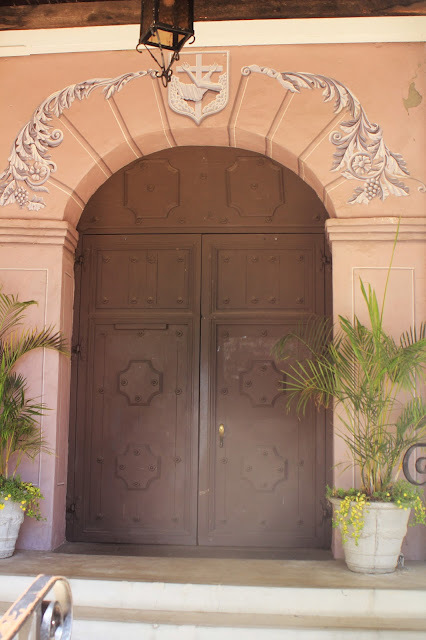 The former convento (which now contains a museum and gift shop) has a distinctive front colonnade of eleven round columns set on square pedestals. 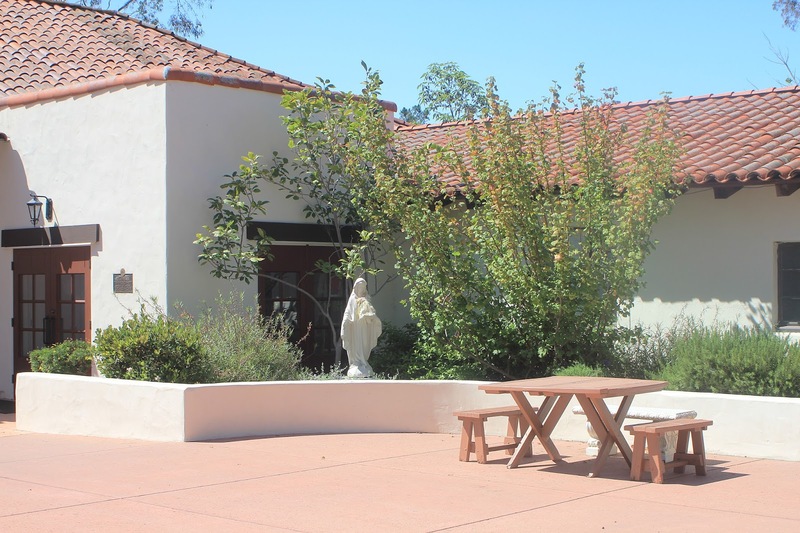 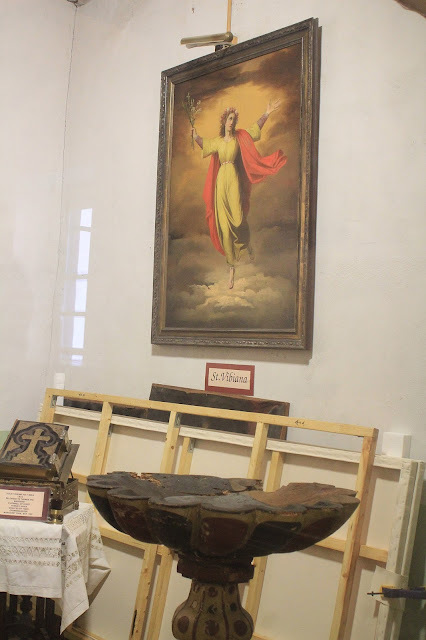 Mission Art: The most significant devotional art is in an alcove on the right hand side of the church, where an illuminated painting of Our Lady of Refuge may be seen. The alcove was once the entrance to the funerary chapel, which led out onto the mission cemetery. 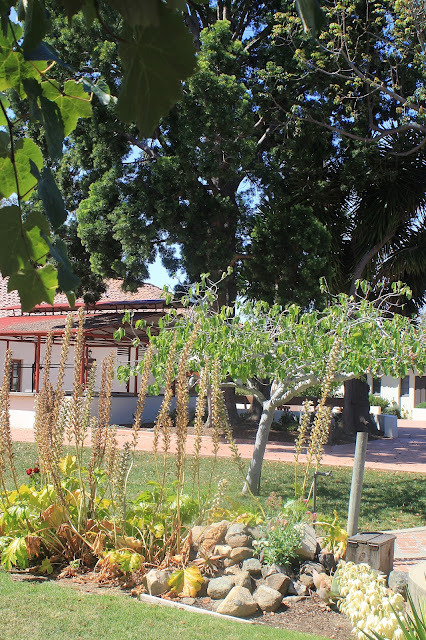 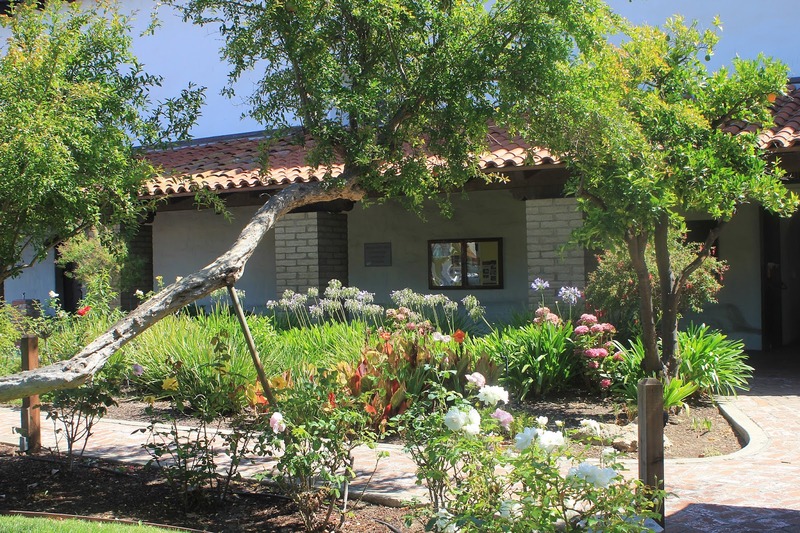 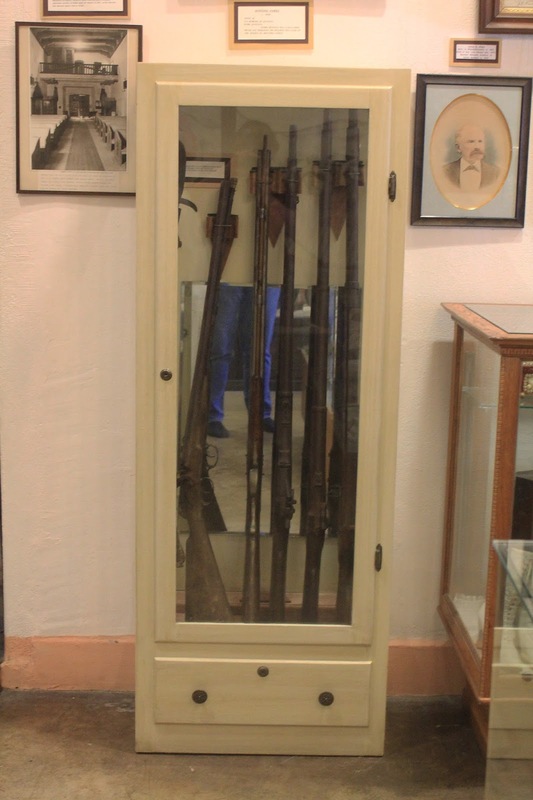 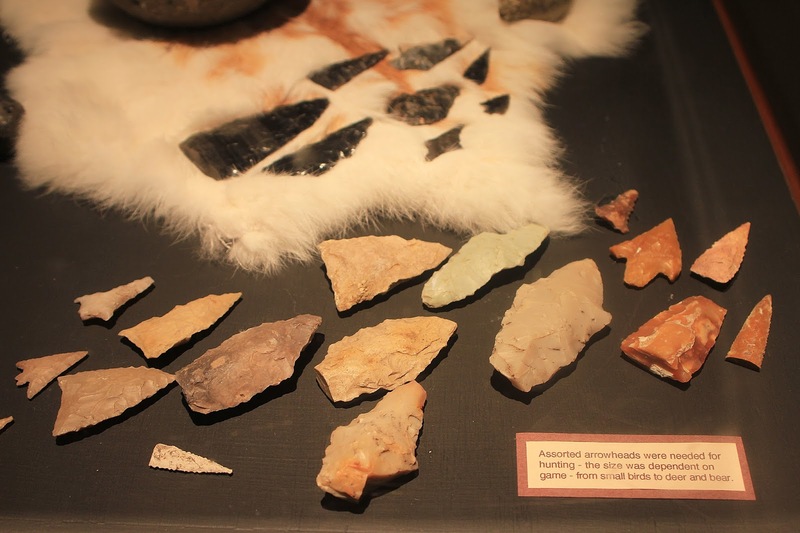 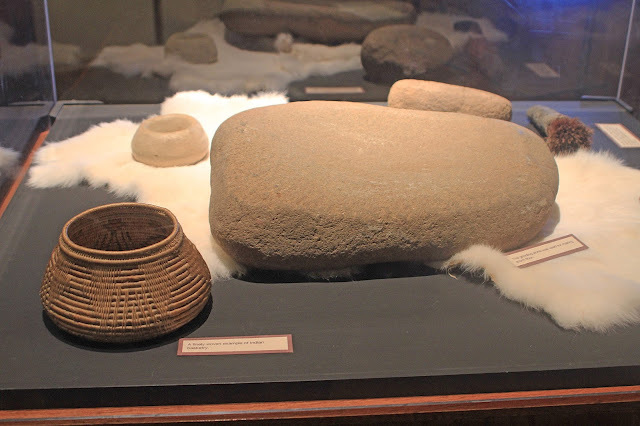 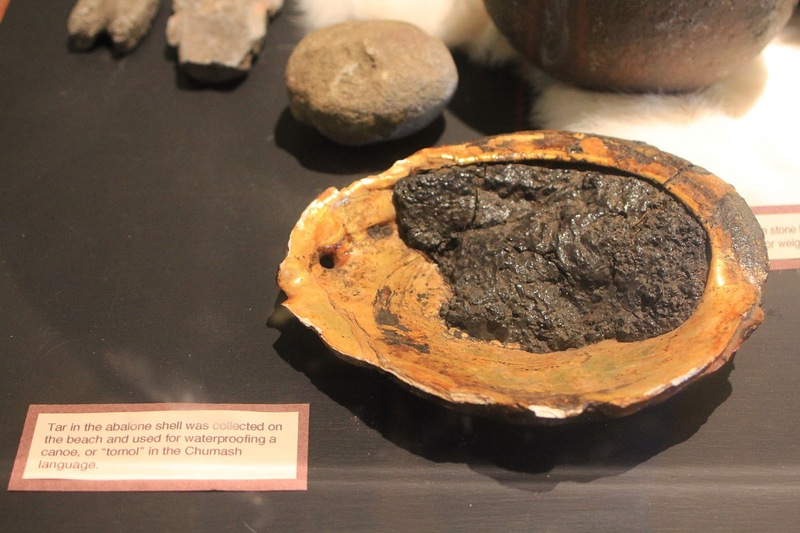 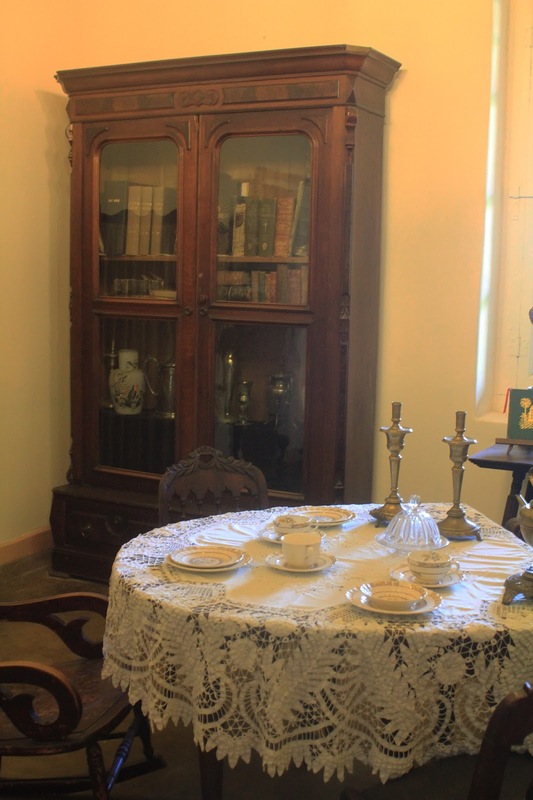 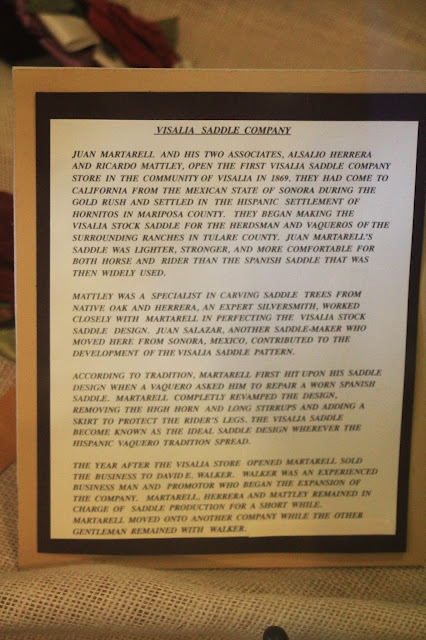 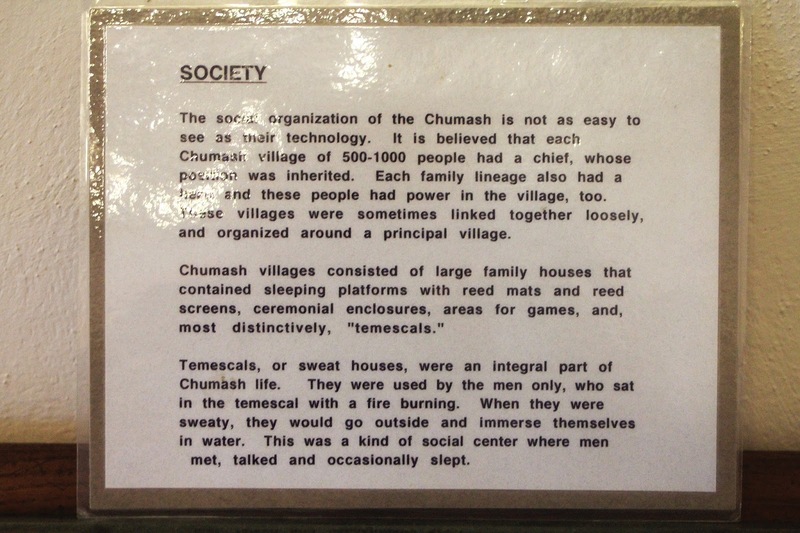 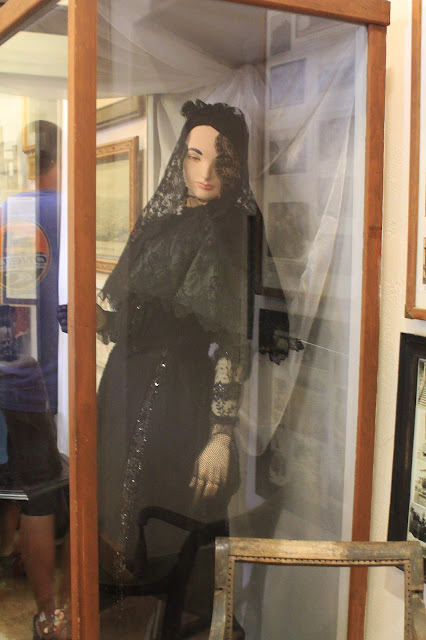 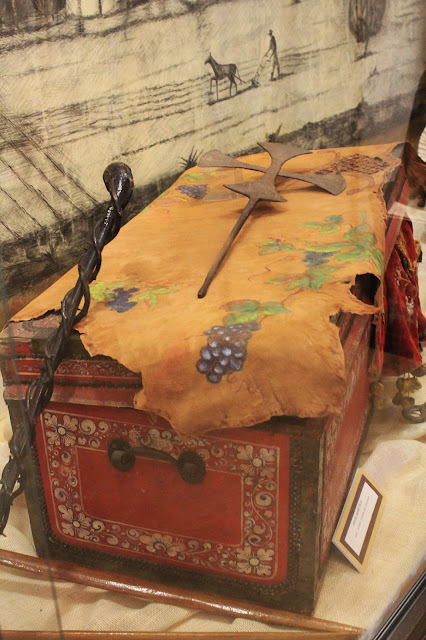 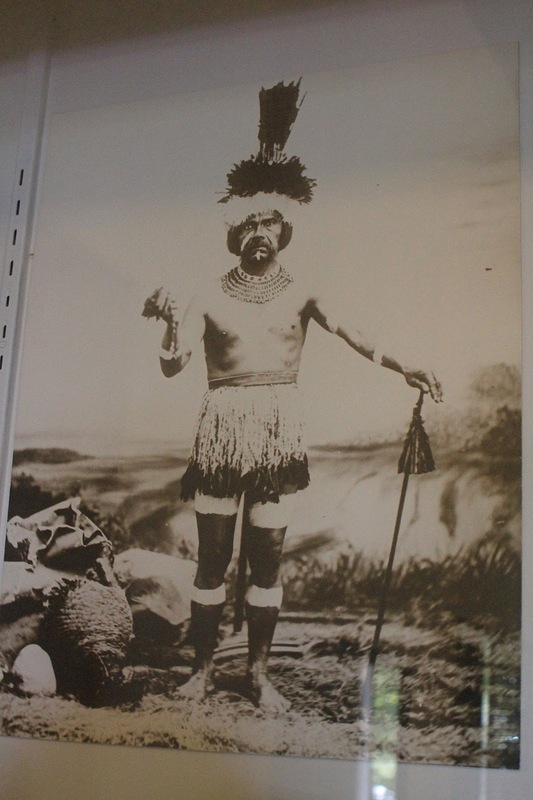 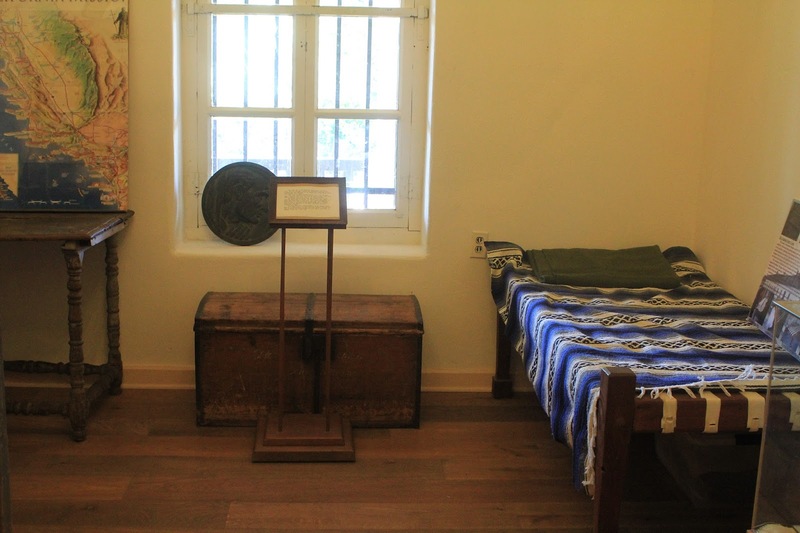 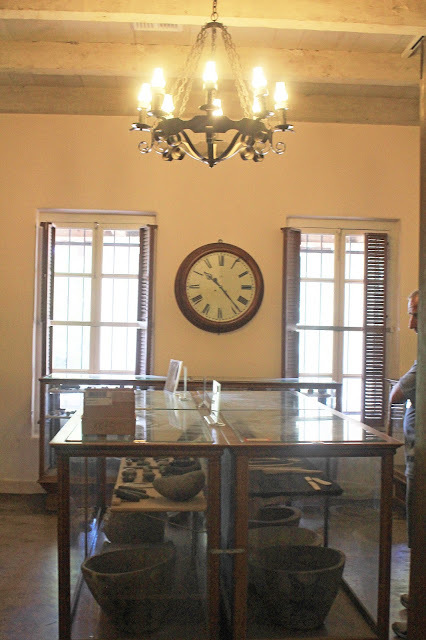 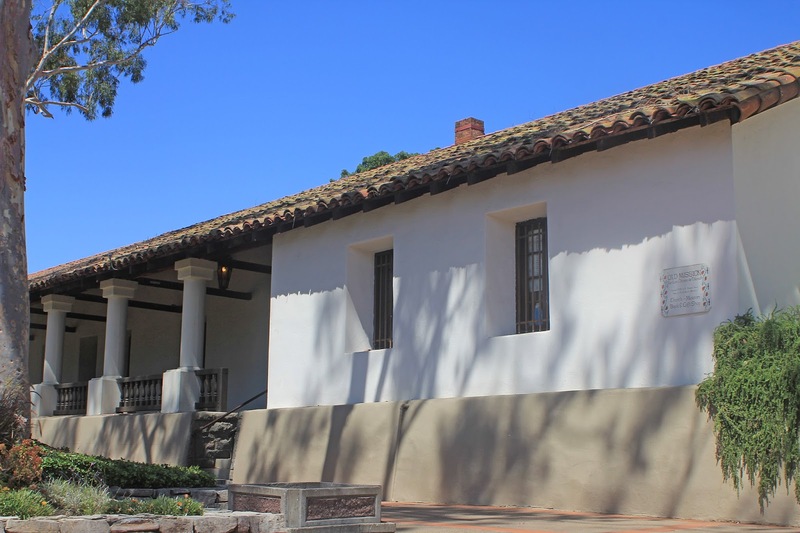 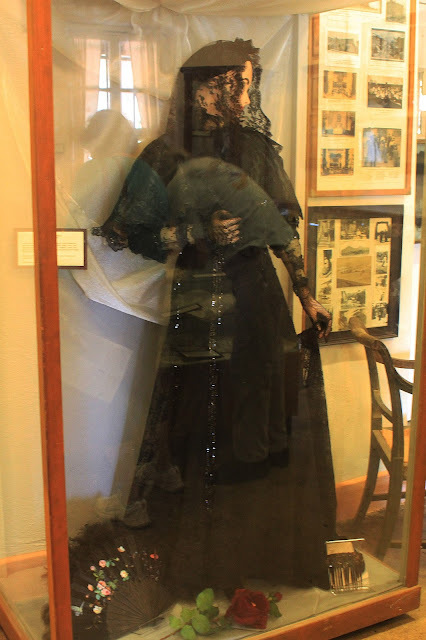 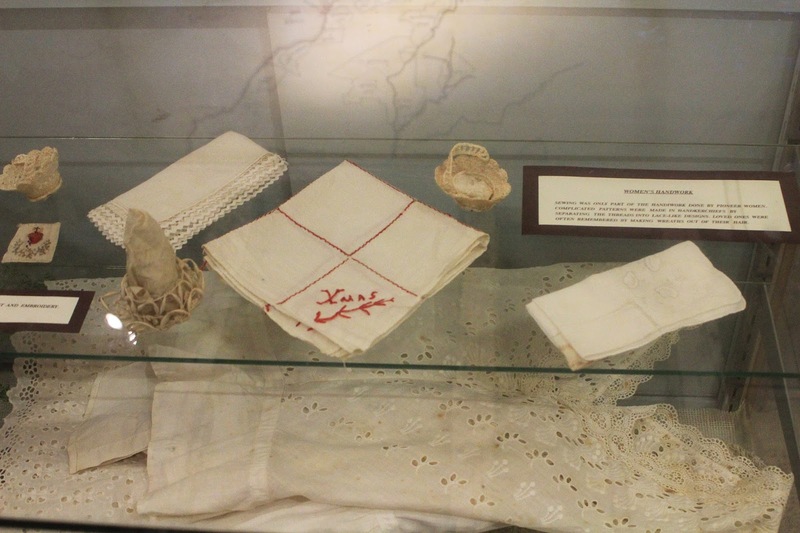 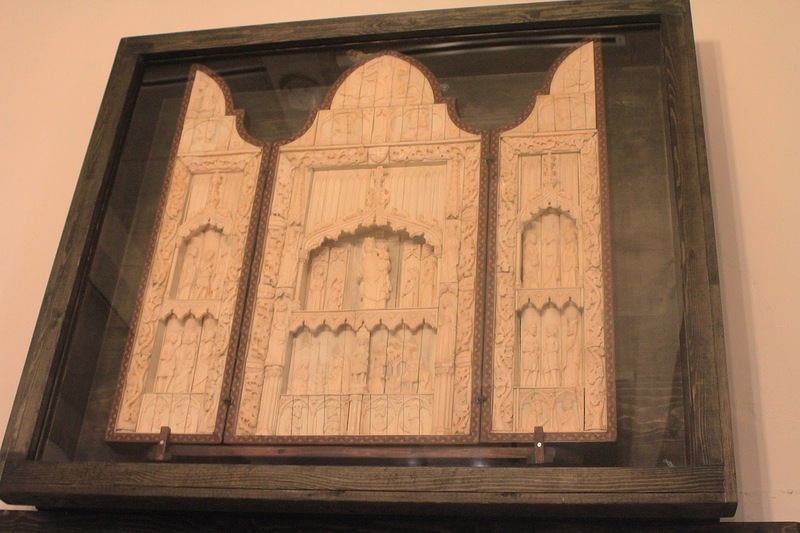 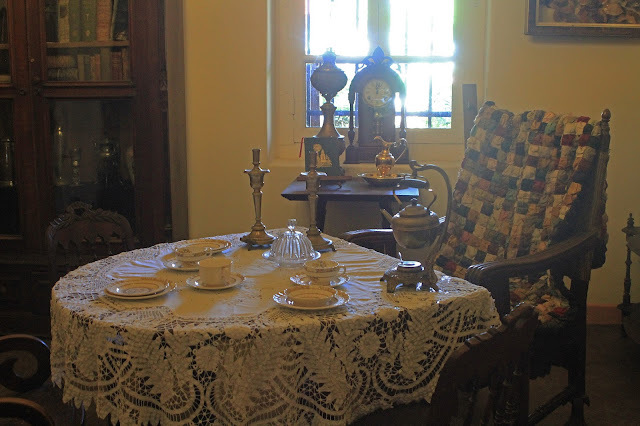 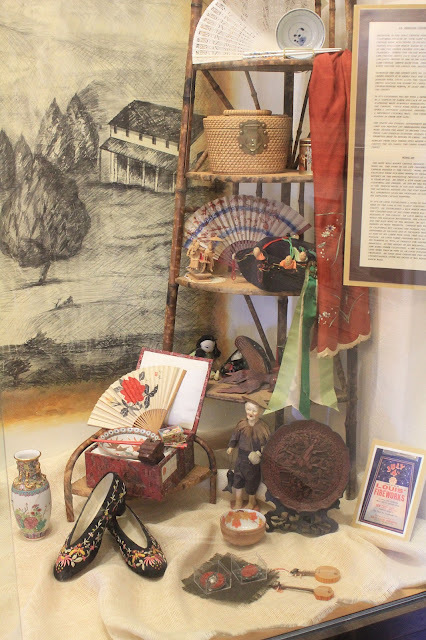 Special Attraction: The mission has an excellent museum with a special room that focuses on the Chumash Indians. The adjacent plaza is a popular site for community events. 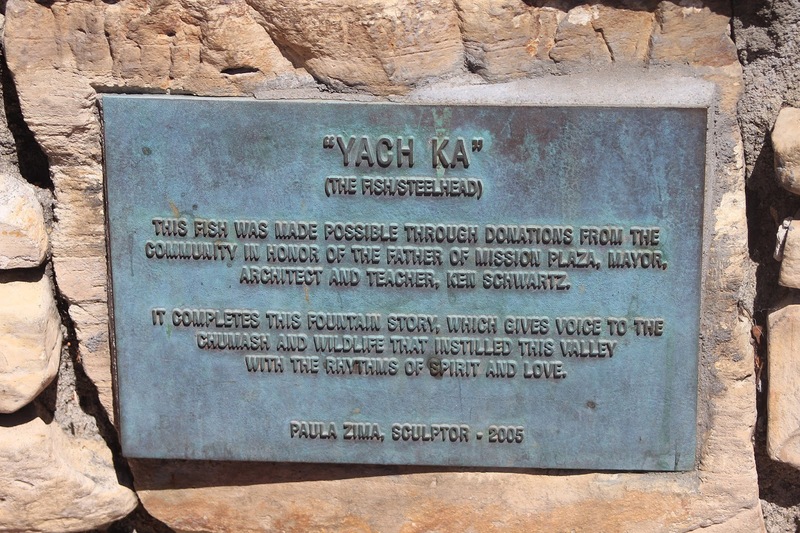 A stream runs through the area. In 1776 a pagan Indian fired an arrow, with a burning wick attached, into one of the dry thatched roofs of San Luis Obispo, starting a fire that nearly destroyed several buildings. This disaster led to experimentation to make tile locally. 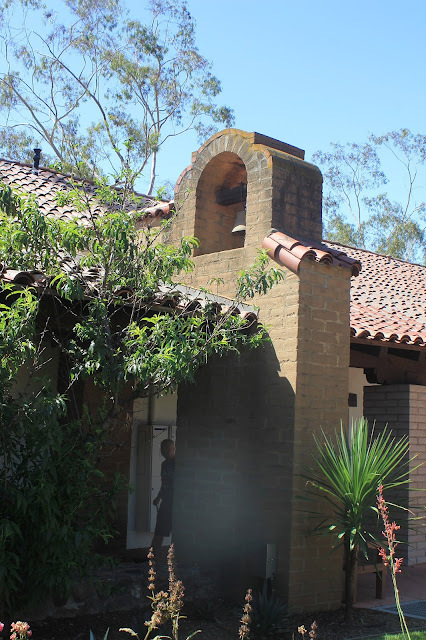 By 1790 most of the missions had tile roofs that were not as vulnerable to attack. 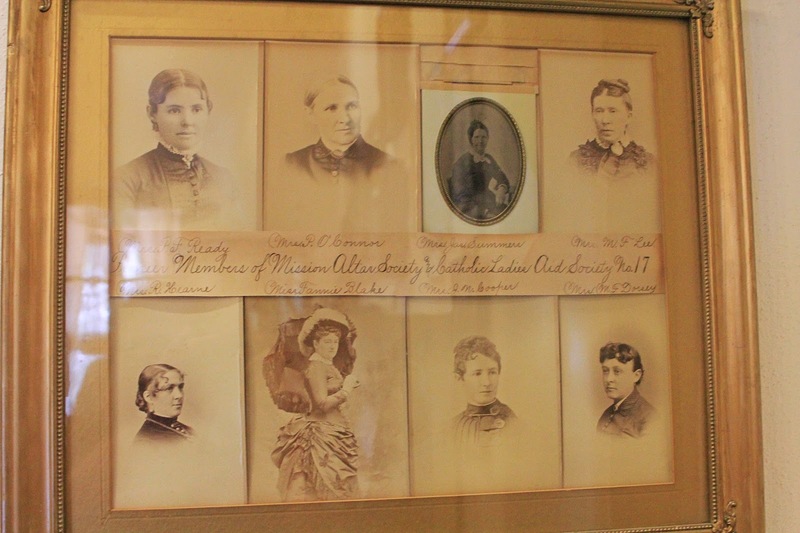 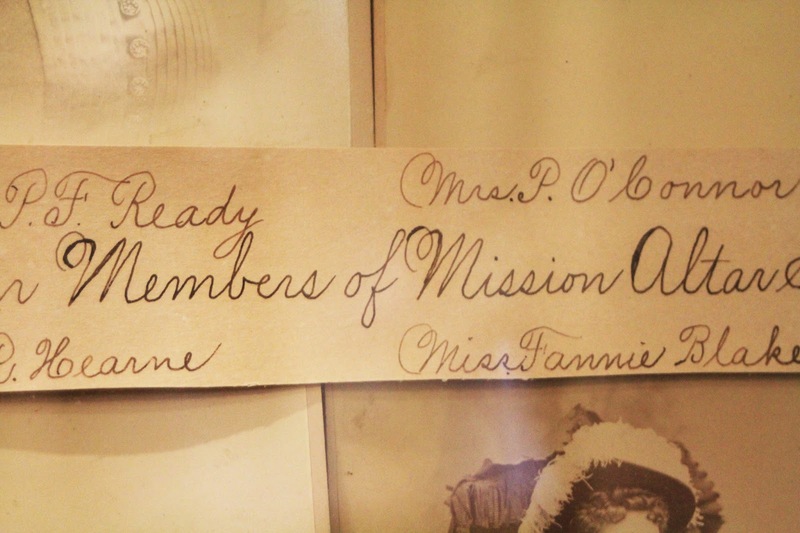 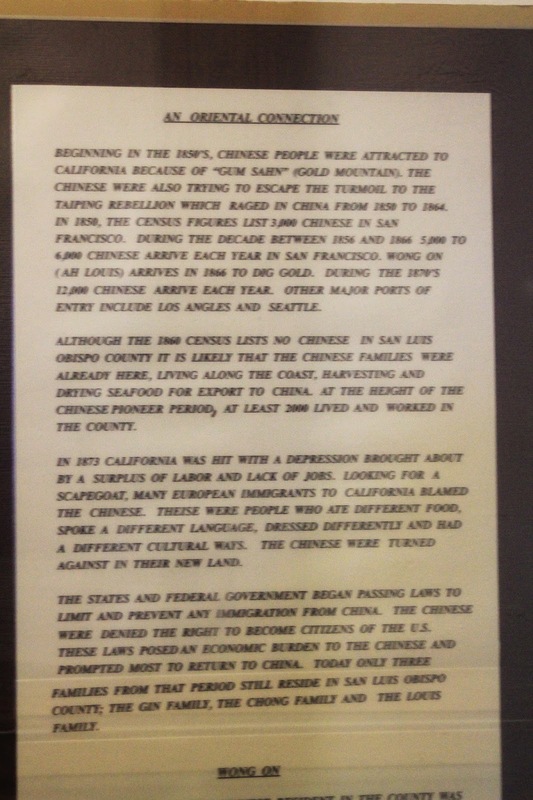 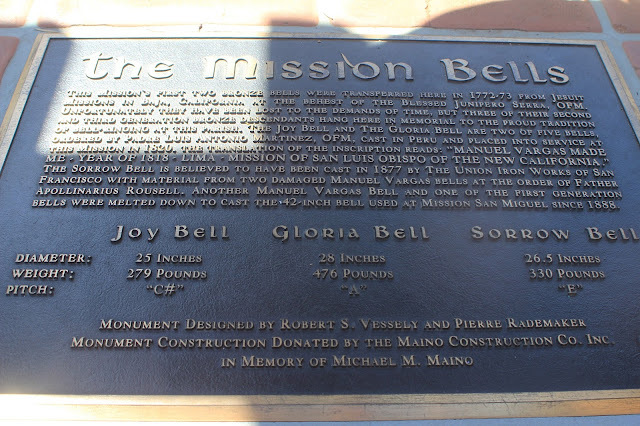 Interesting Facts:The mission had an active life of sixty-three years. 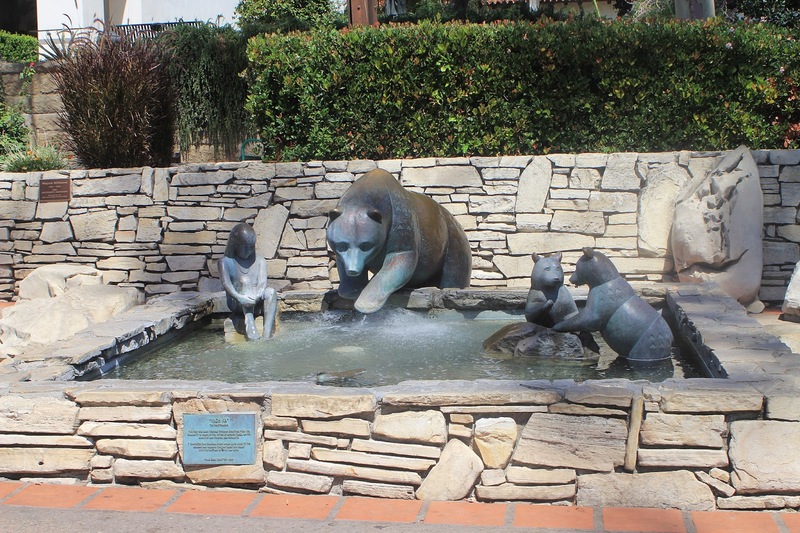 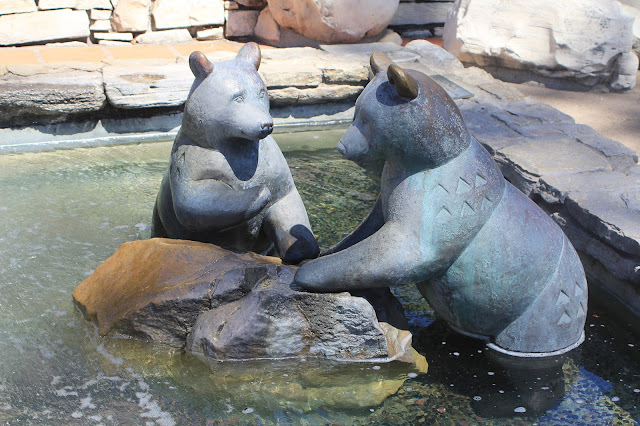 A statue of a grizzly bear in the plaza celebrates the original discovery "La Cañada de los Osos" (Valley of the Bears) by the Portola expedition as they returned to San Diego from a failed attempt to find Monterey in December, 1769. A long secondary nave to the right of the altar forms an L-shaped church plan, the only oneof its kind in the California missions. 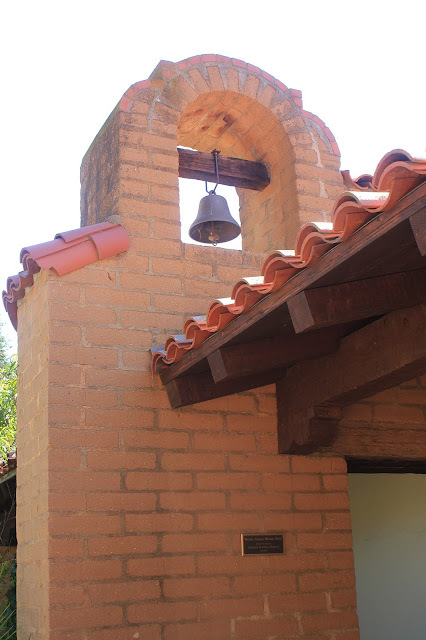 The combination vestibule and belfry at the front facade of the mission, while somewhat similar to that in San Antonio de Padua, is unique among the California missions.